( News still being updated frequently) — A bomb exploded in a church north of Cairo that was packed with Palm Sunday worshippers, killing at least 36 people and wounding 71 others, officials said. The attack in the Nile Delta town of Tanta was the latest in a series of assaults on Egypt’s Christian minority, which makes up around 10 percent of the population and has been repeatedly targeted by Islamic extremists. It comes just weeks before Pope Francis is due to visit the Arab world’s most populous country. Pope Francis decried the bombing, expressing “deep condolences to my brother, Pope Tawadros II, the Coptic church and all of the dear Egyptian nation.” Word of the bombing came as Francis himself was marking Palm Sunday in St. Peter’s Square. Video showing scenes of the church bombing north of Cairo that killed 25 on Palm Sunday. CAUTION: Very graphic images. 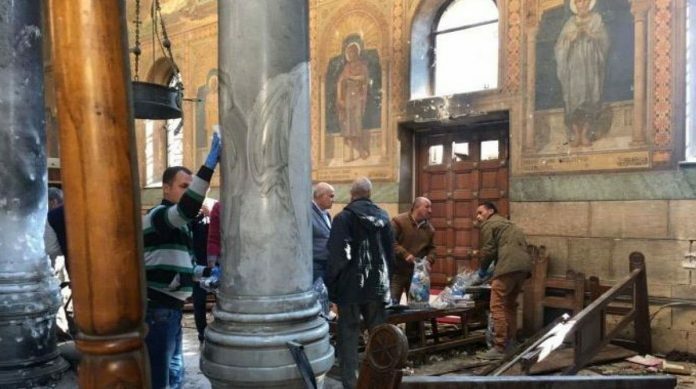 Church bombing north of Cairo kills 25 on Palm Sunday. The attack in the town of Tanta was the latest in a series of assaults on Egypt’s Christian minority.